Multi-species polyculture "grass farm" specializing in 100% pure grass-fed/finished Red Devon Cattle and St. Croix Hair Sheep. 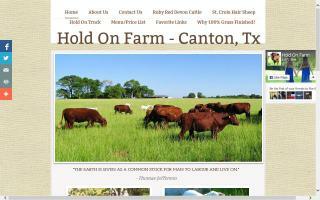 65 acre family owned "grass farm" in Canton, Texas. We raise 100% grass-fed/finished beef and lambs, pastured poultry and eggs. We use zero chemicals or antibiotics on our animals or the land. We practice "Holistic Mob Grazing" to mimic a natural environment to promote healthy immune systems and foraging all in a low-stress environment. The animals we raise produce the most tender and juiciest meats. We truly finish out our animals on grass so they have healthy Omega-3 fats and natural marbling that have real flavor and texture. Our Barred Rock and Rhode Island Red laying hens produce the most delicious and nutrient dense golden egg yolks you'll see around. Sterling Lamb is a family business that strives to produce superior, all natural, quality hair sheep in order to deliver exceptional lamb products to our customers.